Aly Raisman bronze: The American gymnast tied for third in the gymnastics all-around final. Why didn’t she win a medal? Aly Raisman Tied for Third in the Gymnastics All-Around Final. Why Didn’t She Win a Bronze Medal? 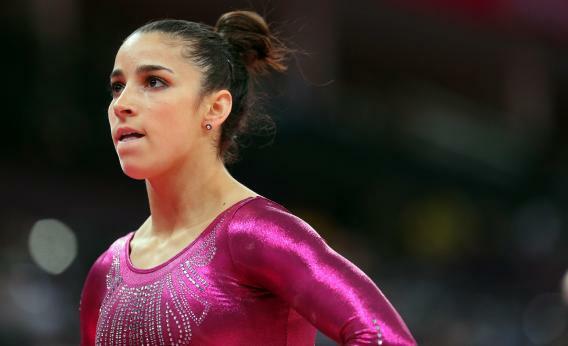 Why didn’t Aly Raisman win bronze in the women’s individual all-around final? American gymnast Gabby Douglas took first place in today’s women’s all-around gymnastics final, while her teammate Aly Raisman finished fourth. Or was it third? At the end of the competition, Raisman was tied with Russian gymnast Aliya Mustafina for third place, with each gymnast scoring 59.566 points. A gymnastics neophyte might think they’d be co-medalists, or compete in a vault-off or something. Instead, the judges conferred, and, in very confusing fashion, awarded Mustafina the bronze medal while relegating Raisman to the sad position of first non-medalist. It’s “a bummer that they can’t just let us both get a bronze medal, but I’m happy for the girls that are on the podium,” Raisman said at the end of the night. What happened? Why didn’t they just let them both have bronze medals? Because that’s not how the Fédération Internationale de Gymnastique rolls. The women’s individual all-around event features four separate exercises. Gymnasts are scored on each exercise, and those scores are combined to determine the overall winner. In the event of a tie, FIG rules mandate that the judges discard each gymnasts’ lowest score and add the remaining three. In this case, after dropping each woman’s lowest mark—a 14.200 on beam for Raisman and a 13.633 on beam for Mustafina—the Russian came out ahead by 0.567 points, securing her the bronze. The deciding factor, then was that Mustafina had the good sense to be really bad on the balance beam rather than just sorta bad, as Raisman was. The American was more consistent than the Russian, with all of her scores ranging between 14.200 and 15.900. Mustafina hit higher highs and lower lows: Her scores were 16.100 (bars), 15.233 (vault), 14.600 (floor), and 13.633 (beam). Which gymnast would you have chosen for third place? That’s easy: You would have chosen both, because they finished in a tie. Besides, you are kind and generous. But the FIG believes in breaking ties, not settling for them. The organization’s tiebreaker procedures are set out in this rulebook, which is the densest document I’ve ever attempted to read. (And I’ve read Atlas Shrugged!) The FIG is one of at least 27 international federations supervising sports at the London Games, and each one of them has its own rulebook and its own procedures for handling ties, protests, scoring, and other matters. The lack of an overarching, unified scoring and appeals procedure has caused a lot problems this week, as spectators and competitors alike seem confused about how events are being scored and whether and how to appeal. So let’s standardize things for 2016. To appeal a ruling, you should hand the judges three crisp, unmarked $100 bills with non-consecutive serial numbers. And if there’s a tie for third place in any sport, give out more than one bronze medal. It’s the right thing to do. And if there are a bunch of ties and the Olympics runs out of bronze, I’m sure the athletes wouldn’t mind waiting a few weeks for the next shipment to come in. Bonus gymnastics tiebreaking trivia: What would have happened if Raisman and Mustafina were still tied after discarding their lowest apparatus scores? The judges would have then looked at who scored best after discarding each gymnast’s two lowest apparatus scores. What if they were still tied after that? The judges would have then looked at the gymnasts’ top three execution scores. (Each gymnast is given a difficulty score and an execution score on each apparatus.) What if they were still tied after that? The judges would have looked at the top two execution scores. What if they were still tied after that? The judges would have moved on to the top three difficulty scores. What if they were still tied after that? The judges would have looked at the top two difficulty scores. What if they were still tied after that? At this point, the FIG rulebook offers no guidance, which puts us into Allyson Felix and Jeneba Tarmoh territory—there is no procedure to break a tie if two gymnasts have the exact same scores across the board. This lack of tiebreaking rigor cannot stand, and there is only one solution: vault-off!